After receiving a Facebook invite with a date and time, I had to gather the necessary items—a silver bowl, a purple candle, lavender oil, a “charged crystal,” and dragon’s blood incense. Most were available at Brooklyn’s Catland, a store for occult sundries. The clerk there sold me some dove’s blood incense while assuring me that substitutions in spells were perfectly kosher, and even anointed my new candle with some lavender oil from her own stash. Each of Detloff’s weekly spells exist to serve some end—healing, awakening, banishment, etc.—and I was about to take part in a truth spell. Image: Pagans of the Path. Witchy Facebook memes are almost uniformly positive. The group that Detloff posts his videos in and helps moderate, Pagans of the Path, is a sort of life raft for the eclectic Wiccan set. 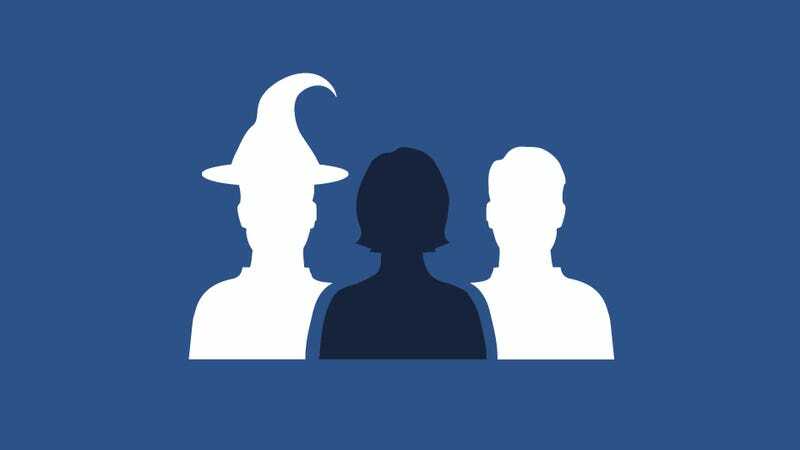 All 1,700+ members share the mutual interest of witchcraft, but in varied forms. Energy healing, Ouija, aeromancy, astrology, fairy magic—all are treated with equal respect and validity. But mostly it’s a place for witchy people to meet, post news, share memes, complain, and offer support. It also provides an outlet for Detloff and others to advertise their business prospects, like chakra balancing ($15) and tarot readings ($10-25). Like many in the group, Detloff, a nurse by trade, found witchcraft as a result of losing something else. “About 6 years ago, our hospital started providing courses in energy healing for our patients to reduce pain and anxiety,” Detloff told me via email. “Over the next couple of years, I was in the midst of an awakening. I was coming out as a gay man, was kicked out of my home church, and my family was also not a great support through this difficult time in my life. I continued on, searching for that higher power who could love me the way that I am.” His parents still attend the church whose priests advised them to cut off contact with their son. Each spell requires a goal or intention from the spellcaster, and in the days before our scheduled ritual, a good friend of mine learned her stomach cancer had taken a turn for the worse. It hadn’t been my reason for contacting Detloff initially, but I thought a little witchcraft might not be the worst addition to standard medical treatment, constant company, and hope. I wanted to know what had happened to make someone inoperably ill at 25 and if she had a chance. Over the course of the ten minute truth spell Detloff, walked me and a handful of others through the order of operations. First we were supposed to “ground, center, and shield” ourselves. This involved deep breathing, mindfulness, and encapsulating our bodies with an egg-like aura of white light. He asked us to imagine a cord traveling through our bodies to the center of the Earth and terminating at the Moon. With the spell complete I felt no different, although if anything were going to happen I’d have to wait for the water to disappear. Being a Saturday night, I went out to meet up with friends and, though I continued to correspond with Detloff, mostly forgot about the spell and the god or gods I’d asked a favor of. It sounded like willful self-delusion. Two weeks after the truth spell I stumbled home around 4am, bleary-eyed from crying. My friend had passed away after a year-long battle with cancer, a sickness that had begun as recurring ovarian cysts and had spread to several of her major organ systems. She died in a hospital bed in Memorial Sloan-Kettering, pumped full of painkillers and drowning in her own bodily fluids. Cancer had made her weak, but pneumonia, of all things, had finally taken her life. The first thing I noticed in my bedroom was the soup pot, still full of water. The spell hadn’t worked, but I’d gotten my answer anyway. I felt annoyed at witchcraft. I felt annoyed at myself for putting even the slightest stock in it. And I felt worried that what I’d write about it would reflect my most uncharitable feelings in that moment, towards someone (or rather, a group of people) who had clearly been through as much or more pain than I was feeling in that moment. Witchcraft provided a replacement for the community from which Detloff had been rejected, one that didn’t share the bigotry of his evangelical upbringing. Many others in the group had experienced similar religious excommunications, recurring health issues, prolonged unemployment, physical and sexual abuse, profound losses. From what I’d seen of Pagans of the Path and similar groups, few people reach witchcraft as a spiritual conclusion without also experiencing trauma. Amateur spell-casting didn’t work for me. Fancy incense didn’t give me any insight to keep my friend alive. A bowl of water didn’t prevent her parents and three siblings from the grief they’re going through. But for Detloff and others, witchcraft provides the crucial service of coping. “If my life so far has taught me anything, it is to live fiercely, courageously, and without apology for who I am,” he wrote me in our last email. When the human spirit is asked to carry too much weight, some find as many gods as they can to lighten the load.